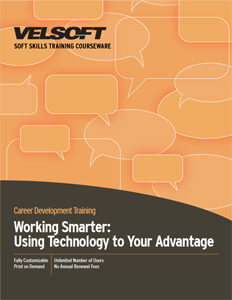 This training courseware title provides everything you need to professionally deliver Working Smarter: Using Technology to your Advantage training including editable training manual, hands-on exercises, exercise files, detailed instructor guide, classroom-ready PowerPoint slides, and unlimited online learning licensing. Seeing is Believing This sample manual to teach Working Smarter: Using Technology to your Advantage is in MS Word format. Your organization can gain a significant, competitive advantage by integrating technology into your daily routine. Although using computers and electronic components can be intimidating, using training materials can help to ease even the most hardnosed, "technology-skeptic." Scheduling meetings with clients, knowledge-sharing between personnel, and accessing important information becomes immediately easier by deciding to use technology to your advantage. Our training materials for Working Smarter: Using Technology to your Advantage have been designed from the perspective that improving communications is the most important activity for organizations to consider. Having technology-competent individuals in the workplace can drastically improve all aspects of the business environment. Knowing how to use electronic devices is critical to developing stronger business relationships. Our customizable training materials offer instructors practical tips to share with their students about increasing their chances for success using technology.